It is official, all 6 of my kids are now in school!! I am a little shocked myself, but excited to watch them learn and grow, it is so fun! The last few weeks have been a whirlwind of family, back to school nights, end of the summer camp outs, and all sorts of activities, including pulling out 3 huge ugly bushes from our back yard (major happy dance :) which was a last minute project. Needless to say my blogging has been on hold, but I did do a project that I have been wanting to complete for YEARS...and let me tell ya, it is SO nice to have! A DIY Magazine Rack for our master bathroom. Ahhhhh. I love cute organization. This happens to be my last contributor post at Oh My! Creative. I have appreciated the opportunity to share on Susan's blog for the past year, it has been a great experience! So hope on over and check it out, I have a super easy tutorial...and it doesn't have to be used for just magazines. You could make this for piano books, school papers, office work, scrapbook paper, the storage ideas are endless! Thanks so much and have a happy day! Now that your kids are all in school, what are you up to? Are you still working on your patio? What a fun and creative project. Love the addition of the letters. Thanks for sharing at Vintage Inspiration Party. I love simple and easy, but visually awesome ideas! This is all of those. Thanks for sharing! Great job, love this! I'd want to make one for my room and children's reading area. Sharing on my FB page today and thanks for sharing on #merrymonday! I am loving this! I'm pinning. Thank you for linking up at #MerryMonday linky party; we hope to see you tomorrow! Love love! Thank you for sharing this post at City of Creative Dream's City of Links last Friday! I loved this post so much that I chose it to be featured for this weeks party. :) Go grab a button you deserve it! 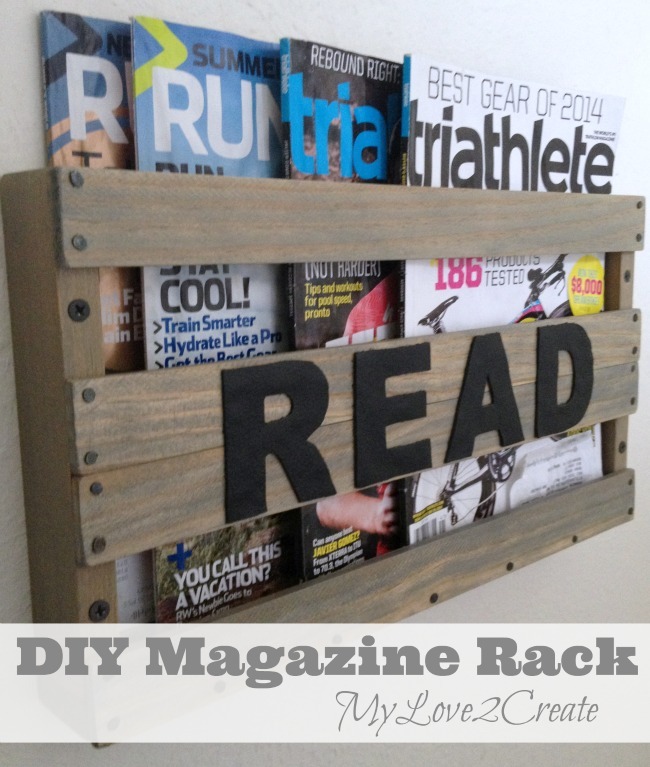 This magazine rack is so amazing Mindi- you always impress me, time and time again!! So cute! And of course they're running magazines! Ha!